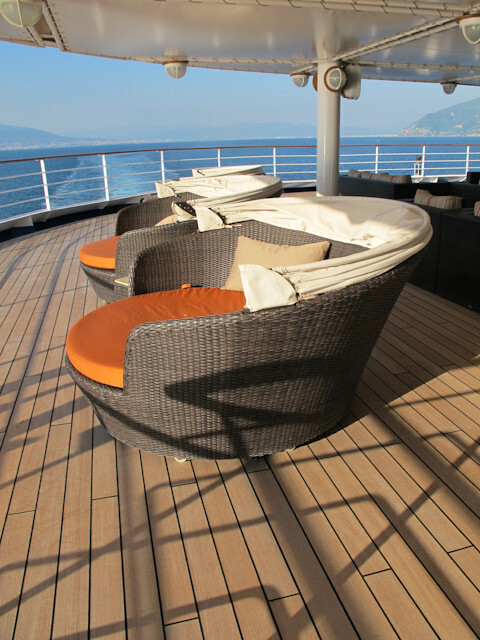 Ultra-luxury line Silversea built its reputation on providing guests with an exemplary cruise experience at every turn. 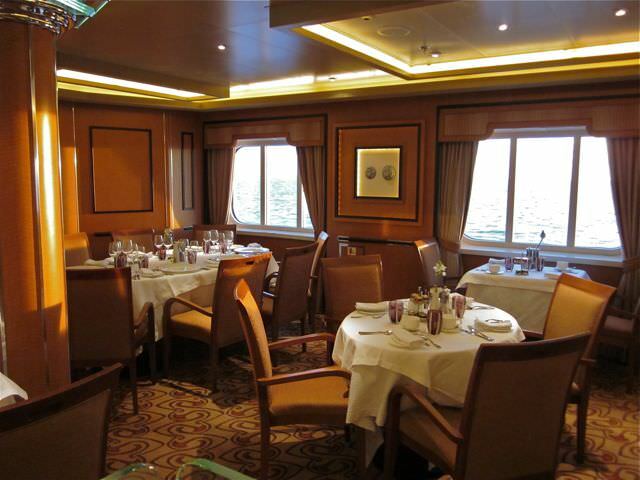 Small, intimate ships featuring comfortable public areas and uncommonly spacious staterooms mesh well with the line’s dedicated service and cuisine. 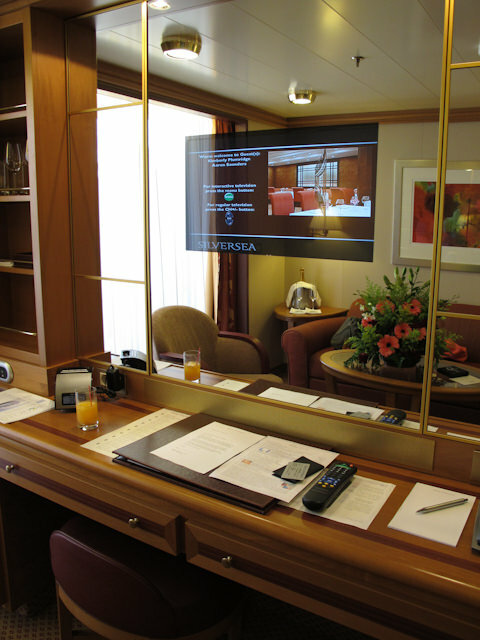 Did you know that every suite aboard Silversea comes with the service of a butler and stateroom attendant? Their goal is to anticipate your every need; even the ones you haven’t thought of yet. It’s this kind of service that has made passengers return voyage after voyage. But every good line needs to grow, and Silversea did just that in 2009 when they launched their most ambitious vessel to date: the beautiful Silver Spirit. 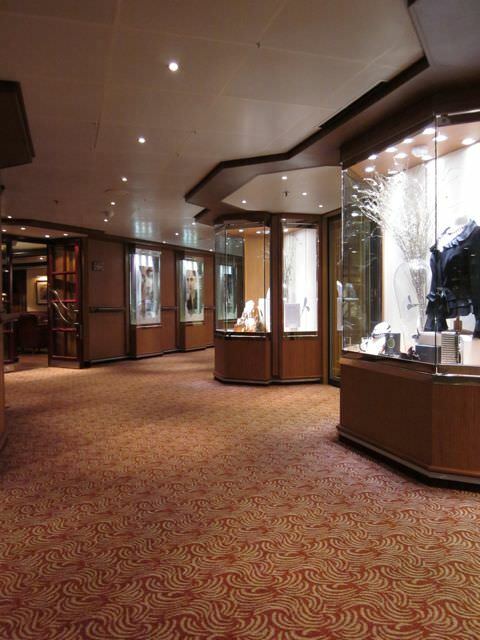 At 642 feet in length, Silver Spirit is also Silversea’s largest ship, capable of carrying 540 lucky guests. But this increase in passengers doesn’t mean a decrease in available space; in fact, you’re more likely to wonder where the other 539 passengers are! 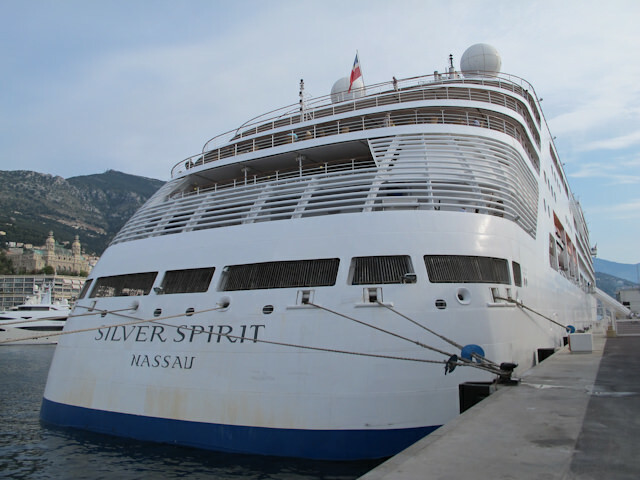 Although we’ve been fortunate to sail twice on this beautiful ship, it occurred to us we’ve never given Silver Spirit the full deck-by-deck Photo Tour treatment she deserves. 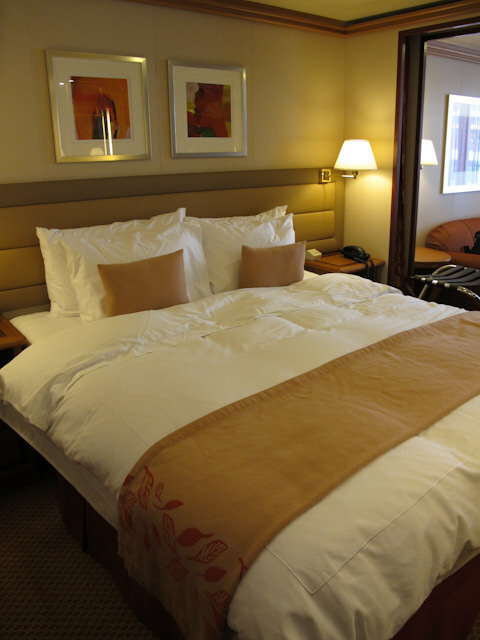 We even managed to snag pictures of a few different stateroom categories, though there are many more available than we’ve listed here. 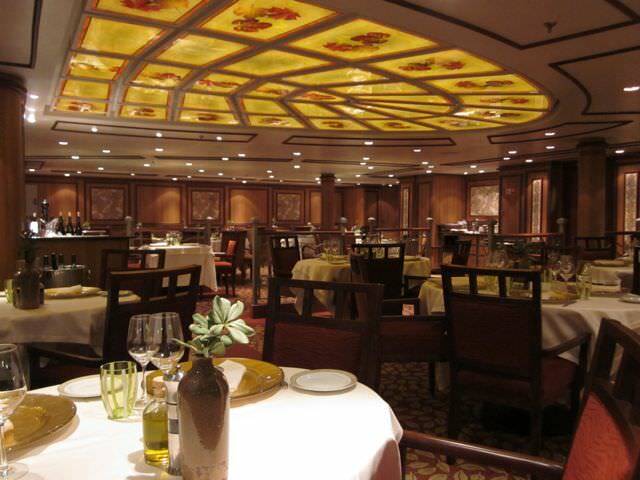 Deck 4 is home to some of Silver Spirit’s best dining venues, located amidships. 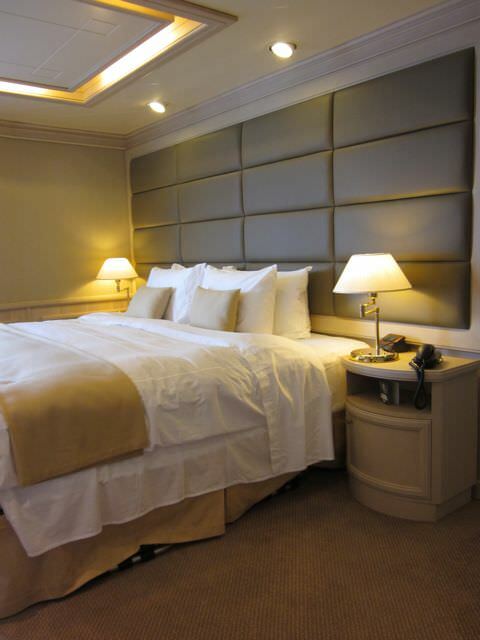 It also houses the ship’s small compliment of ocean view staterooms, located all the way forward. 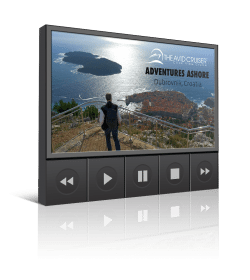 In typical Silversea fashion, these are anything but cramped, and represent a great value for budget-conscious travelers and solo cruisers. 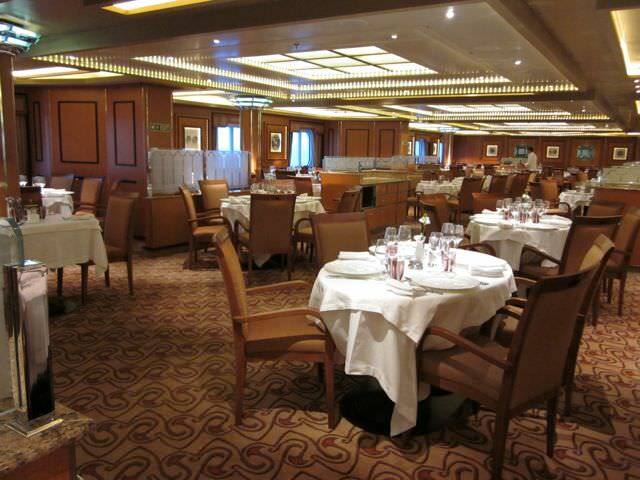 Silver Spirit’s largest dining venue is its main dining room, appropriately called “The Restaurant.” Flanked by large picture windows on either side, this attractive room features light wood paneling, glass partitions, and ample doses of marble. Meals are always open-seating, and guests never have to worry about traditional “Early” and “Late” settings. Just arrive anytime between the posted operating hours, and you’ll always be welcomed. We also never had an issue being seated, whether we were requesting a table for two or a table for ten. The food here is excellent, both in quality and presentation. 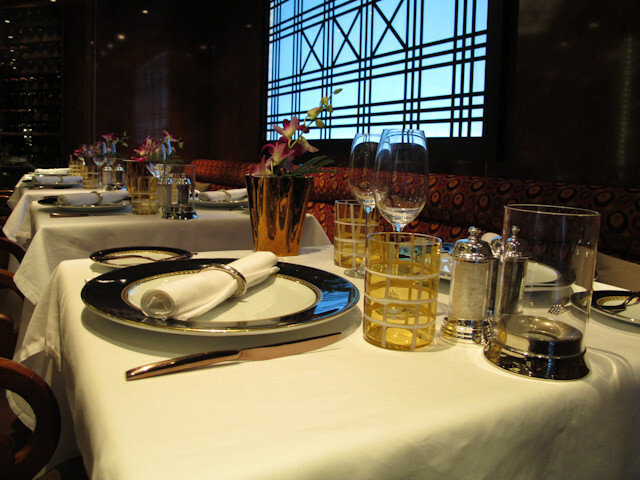 In fact, it’s so good you might have to pry yourself away to try some of Silver Spirit’s alternate dining venues; venues like the two that flank the entrance to The Restaurant. 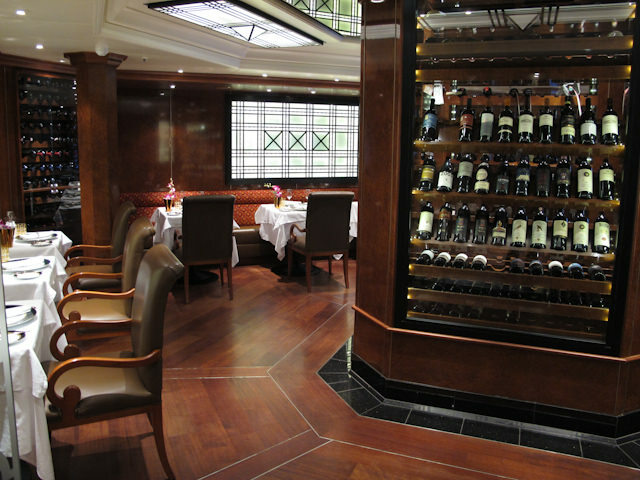 Located just off the entrance to The Restaurant, on the starboard side, is Le Champagne. Anchored by a large octagonal wine cooler, this small, intimate room is a beautiful place to enjoy one of the best meals you may have onboard. Le Champagne comes with an extra cost, a decision that is still hotly contested on internet message boards. 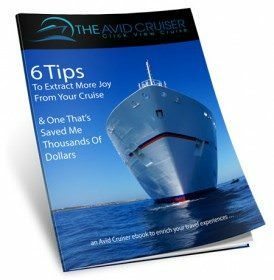 Frankly, we don’t see the complaint for two reasons: one, Silversea offers some great onboard spending credit incentives on most voyages that render the surcharge moot, and secondly, the food and wines you’ll be enjoying are far from average. For $200 per person, guests are treated to a sumptuous, multi-course meal paired with rare and vintage wines. If, like my fiancée, you don’t drink, don’t worry: for the very affordable price of $30 per person, you can still enjoy dinner here, minus the wine pairings. I don’t know about you, but where I live, $30 buys a half-decent meal at a chain restaurant. For the gourmet experience you’ll have here, that price is an absolute bargain. On the opposite side of the entrance to The Restaurant is Seishin, a unique Japanese culinary experience that debuted aboard the Silver Spirit. 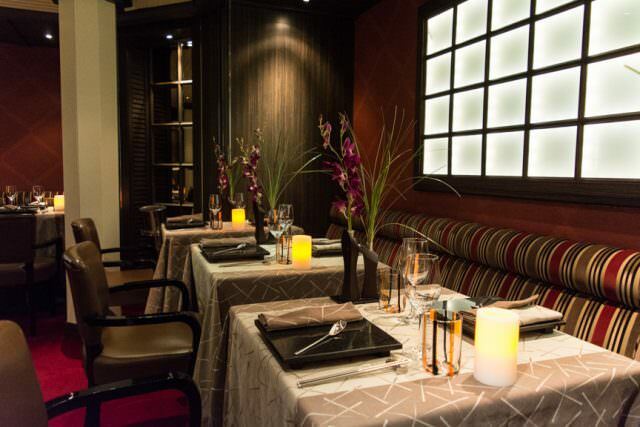 The room is laid out very much like the adjacent Le Champagne, but with an octagonal preparation counter in the middle, where your chef will prepare some of the fantastic sushi and sashimi you’ll enjoy. Like Le Champagne, there is a surcharge to dine here, but as I mentioned above, it shouldn’t put you off. For $80 per person, guests can enjoy a sumptuous multi-course meal paired with exquisite varieties of Sake. If you don’t drink or aren’t into Sake, you can still enjoy the offerings here for $30. 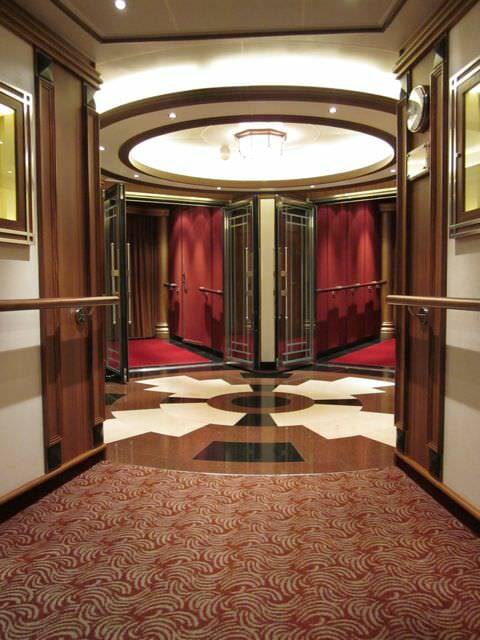 The first thing you’ll see when you step aboard the Silver Spirit is not some multi-story atrium decked out in glass and brass. 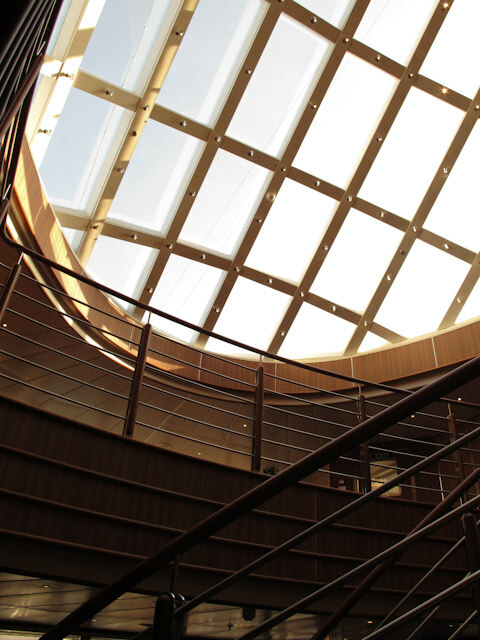 Instead, you’ll find yourself stepping back in time in the beautifully designed Reception Lobby. Shades of green and blue offset beautiful dark wood accents on desks, support columns and paneling to create an elegant, almost 1930’s quality that is designed to impress you slowly, and over time. The Reception Desk is located here, as are desks for Shore Excursions and the ship’s International Language Ambassador, who is trained to assist guests in the language of their choice; a perfect decision given the multicultural nature of Silversea’s clientele and destinations. 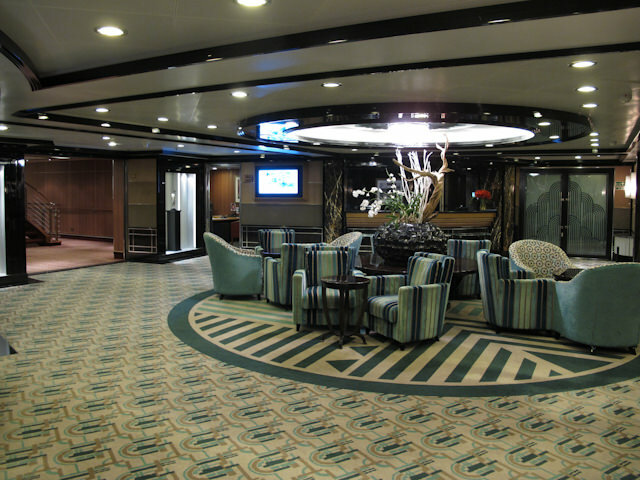 Unlike previous Silversea vessels, the Show Lounge aboard Silver Spirit is a one-story affair. 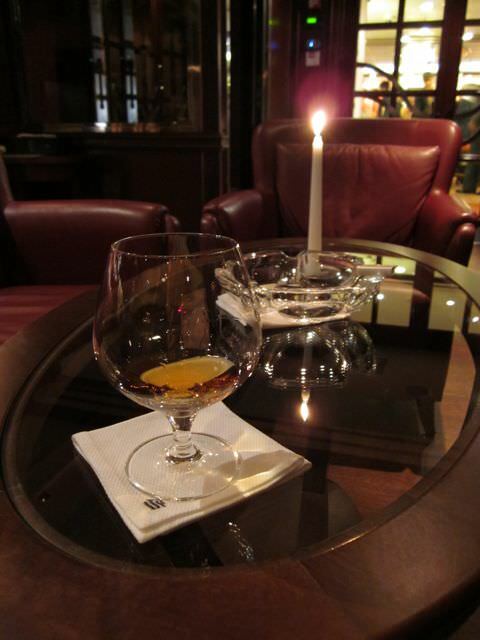 However, it still offers the same great atmosphere: cozy, clubby and vaguely European. By day, this room may be used for guest lecturers and culinary demonstrations. 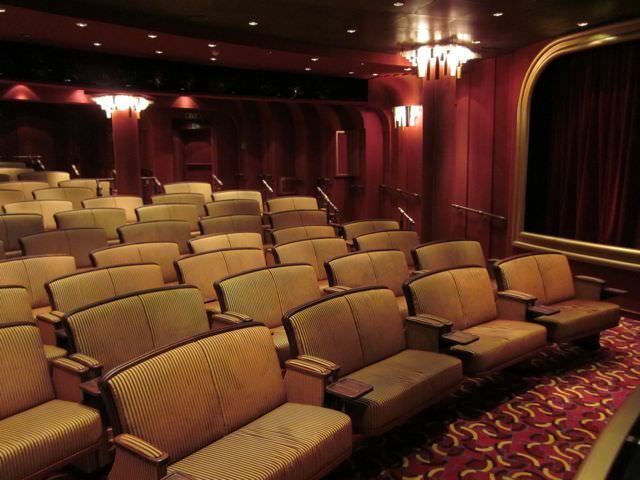 At night, it becomes a venue for Broadway-style shows and production numbers. 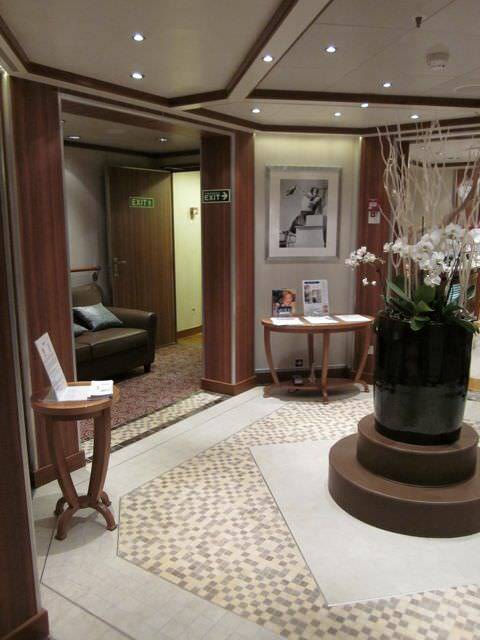 Located all the way aft on Deck 6 is the soothing Spa at Silversea. 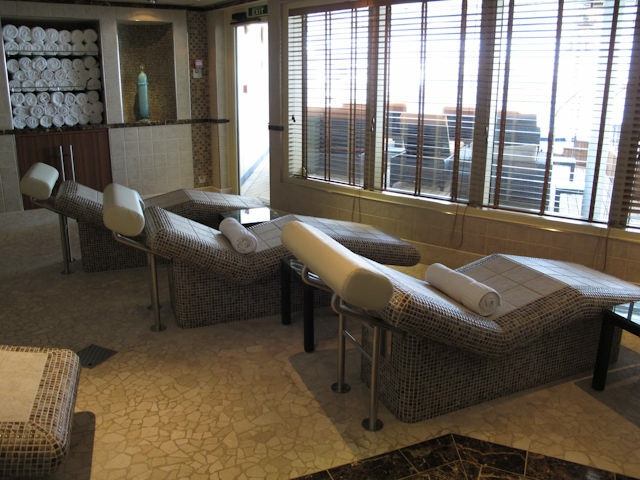 The largest Spa and fitness area aboard any Silversea ship, this fantastic space offers guests any number of ways to fully relax. 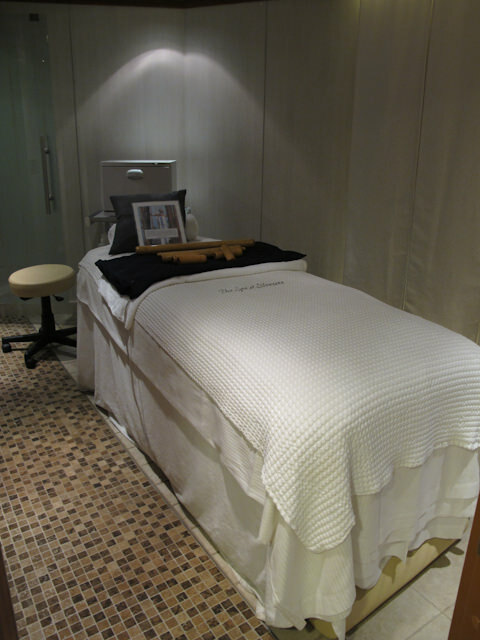 There’s a dedicated fitness centre, a proper yoga room, a hair and beauty salon featuring all the usual offerings, and numerous treatment rooms for massages, hot stones, and acupuncture. But the relaxing smell of lavender carries us to the most impressive addition: the Thermal Suite, with its heated stone loungers, adjacent steam and sauna rooms, and even a Russian ice bath. 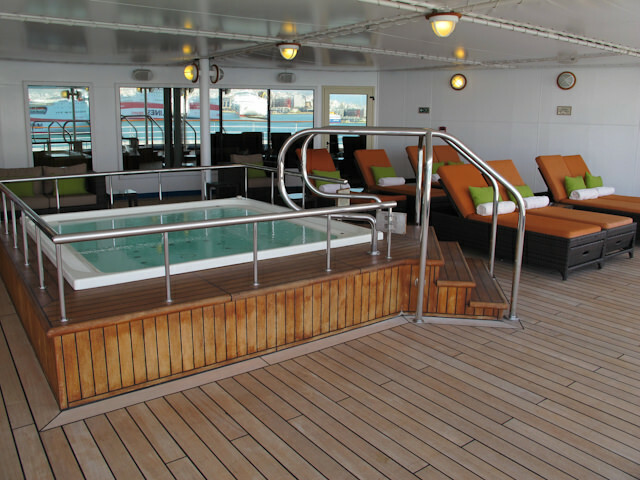 Enormous picture windows open up to the aft outer deck, where Spa guests can enjoy a relaxing soak in the oversize hot tub or cool off on one of the shaded loungers. A first aboard any Silversea ship, passes to the Thermal Suite can be purchased on a daily basis, or as a pass for the entire voyage. 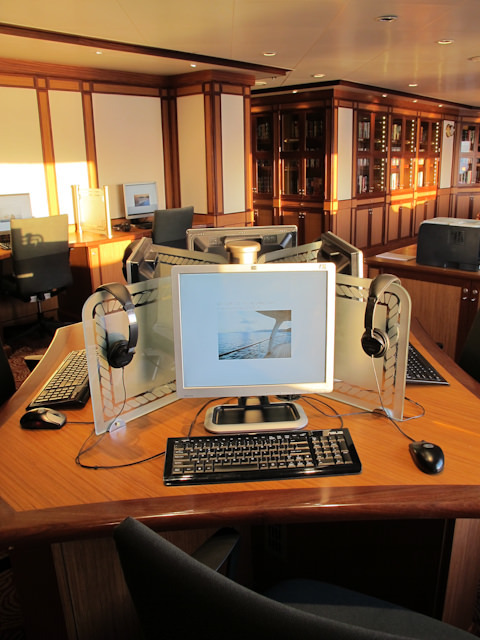 Old-world meets modern technology in Silver Spirit’s combination Library and Internet Café. 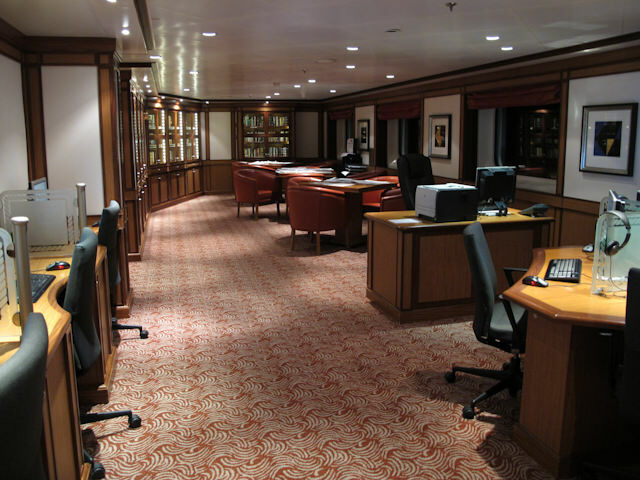 Located on Deck 7, this inviting room contains books on almost every subject (and in almost every language), as well as hosting games, magazines, and several internet stations. 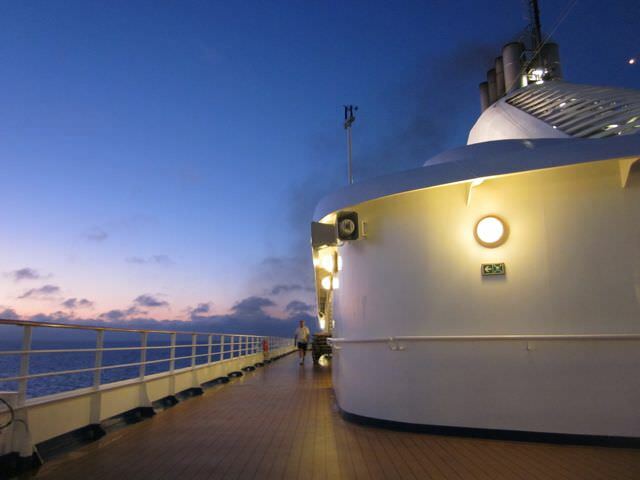 For those who bring their own wireless internet device with them, WiFi can also be accessed in the ship’s public areas and staterooms. 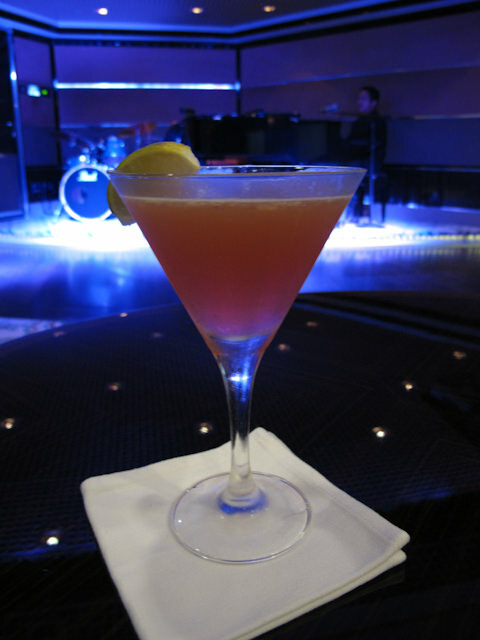 The unquestionable mega-hit introduced aboard Silver Spirit, Stars is usually standing-room only in the evenings, as guests enjoy dinner and drinks accompanied by live jazz music that kicks off late at night. The talent is fantastic, and the astonishing menu is equal to it in every way. Our only complaint: with seating for just 26 people, on popular nights this room could be twice as big and still not pack everyone in. An absolute must-experience. Open for breakfast, lunch and dinner, La Terrazza is the place to go for casual fare, though that description really doesn’t do this attractive spot justice. Breakfast and lunch can be taken from the buffet of delicacies, or ordered off the menu. At night, La Terrazza becomes a reservations-only Italian specialty restaurant that carries no additional charge. Silversea makes its own pasta noodles right onboard the ship, and the menu options are delectable. Our favorite place to sit, though, is outside on the veranda, where guests can enjoy meals in almost any weather conditions. Grand Suites feature a full living room and dining area, complete with a full bar setup. 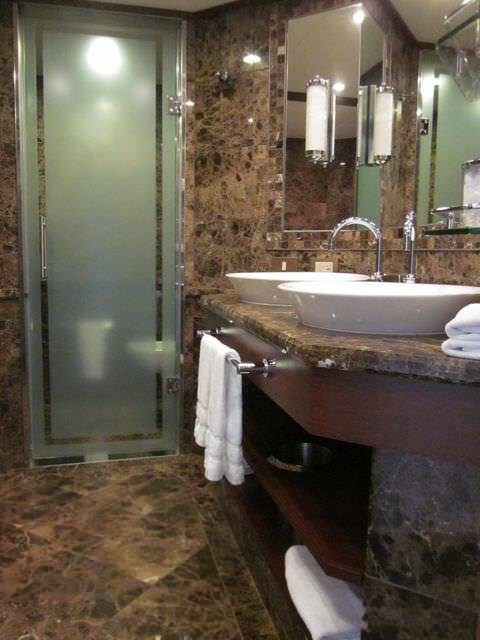 A separate bathroom is provided for visiting guests, clad entirely in marble and cherry wood accents. Off the living room are a spacious bedroom and an enormous walk-in closet. 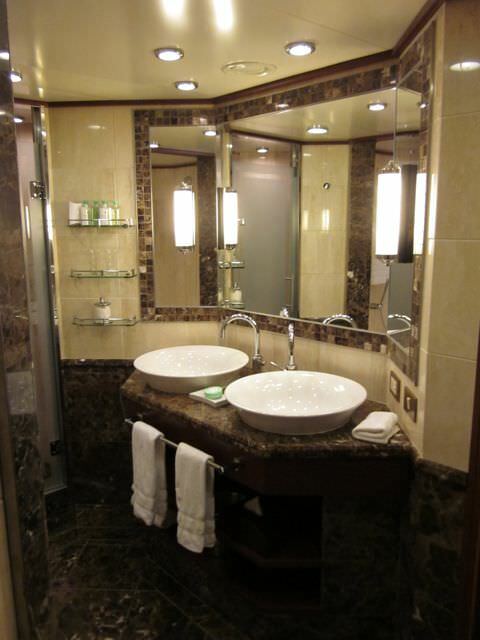 At almost 1,500 square feet, if ever there was a suite that screamed “World Cruise!” it is this. 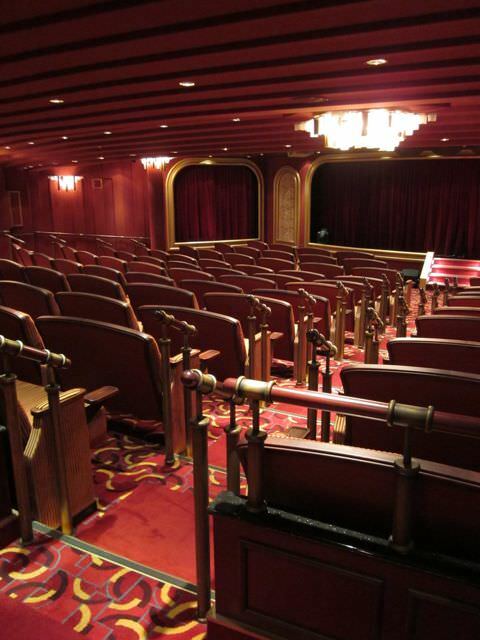 But the feature that makes me weak in the knees (and makes my credit card issuer smile) is the fabulous wraparound balcony that overlooks the ship’s bow and one entire side of the ship. 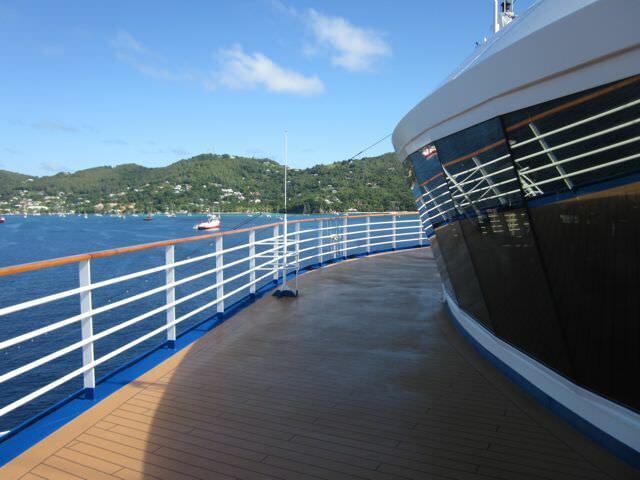 A bulkhead railing protects you from the worst of the wind, and it’s not a stretch to imagine enjoying a book and a drink as you sail the Caribbean or Mediterranean. The partition at the forward end of the balcony can also be opened to allow access to the adjoining suite for families and guests sailing together. 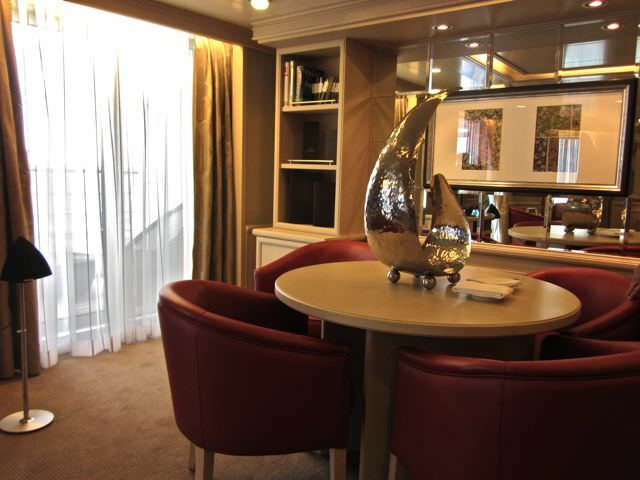 The most common type of accommodation aboard Silver Spirit, these 376-square foot verandah suites are nothing to take for granted. Each has a large living area that can be separated from the sleeping area via pull-back curtains. 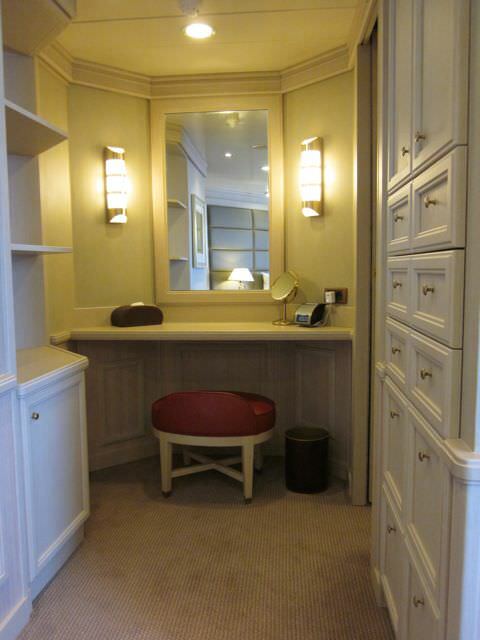 Two flat panel televisions, cleverly recessed into the vanity mirrors, are also included. Balconies are large enough to support two chairs with footrests and a small table, and the bathroom is uncommonly large and features a full shower and a separate full-size bathtub. Every suite aboard Silver Spirit comes with the services of a butler and an attendant, both of whom will impress you with their dedication and thoughtfulness. It might be as simple as returning to find your shoes already polished, or your luggage unpacked and hung up. Service is pampering, but never, ever, stuffy or awkward. 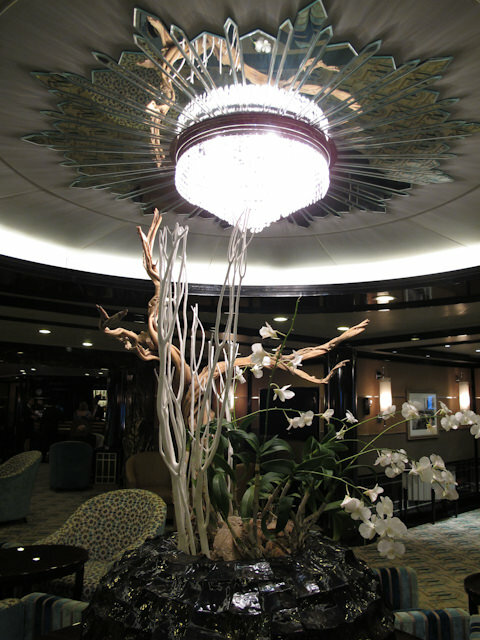 If you’ve ever looked wistfully at the smoking rooms on the great transatlantic liners, you’ll love the Connoisseur’s Corner aboard Silver Spirit. 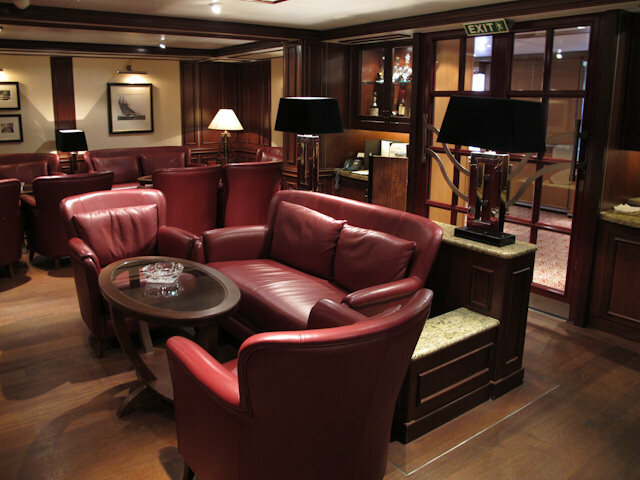 Comfortable, leather-backed seating and soft mood lighting make this a great, tucked-away spot to enjoy a nightcap or a fine cigar. Impressively, it hardly smells like smoke in here, thanks to a dedicated ventilation system. 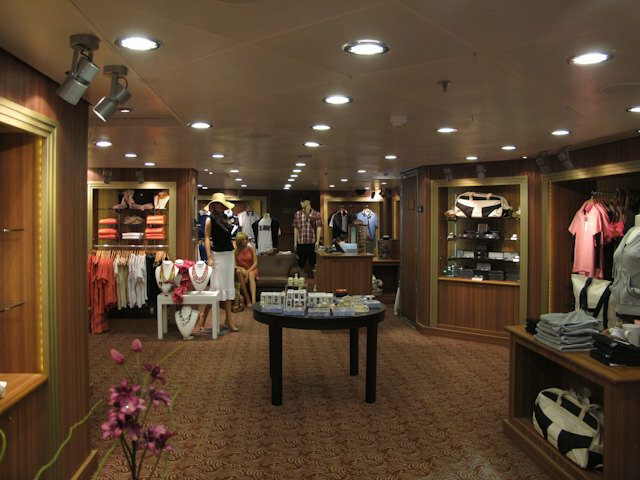 Silver Spirit boasts a number of high-end boutiques tucked away aft on Deck 8, along with a gift shop selling sundries, logo wear, and clothing. But before we give in to temptation and buy that Tissot we’ve been pining for, let’s walk (quickly!) to the Casino. Perhaps there’s something patrons of the Casino know that I don’t, because every time I walk by there, no one is around. 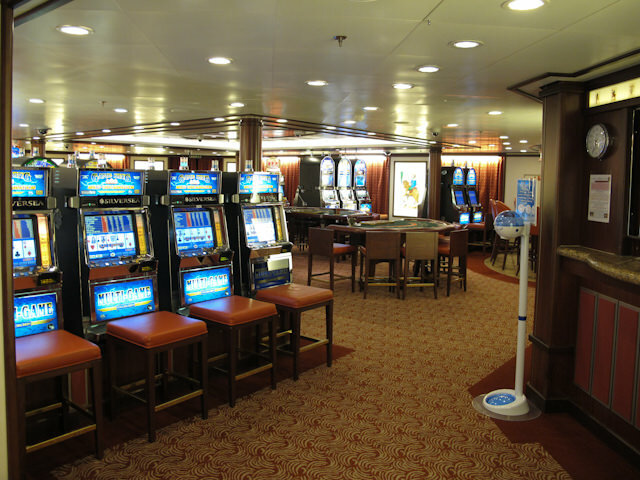 Gambling just doesn’t seem to be a major pastime of Silversea’s guests, and though it was fairly well used on our Mediterranean voyage, it’s nothing like the crowded, round-the-clock gambling that happens on many mainstream ships. 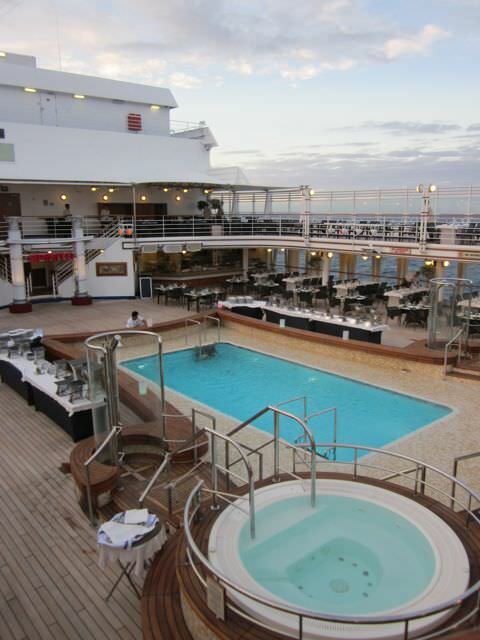 One cool point for Silversea: bingo is offered daily, and it’s free! Players compete for points that can be combined with other points-based games, like Trivia, to redeem for prizes at the end of the cruise. 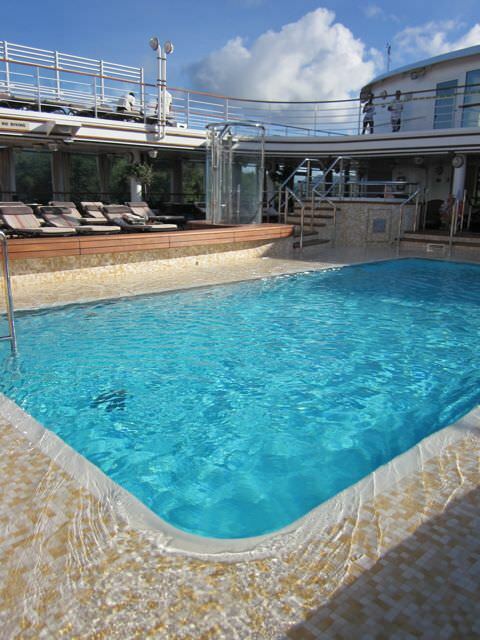 The inviting Midship pool contains everything a good pool deck should: a bar, a casual eating area flanked with olive trees and proper tables (with tableside service, no less!) a pool, and two great hot tubs. Looking for a casual snack by the pool? Order the chips, salsa & guacamole; they’re made fresh onboard and they are spectacular. 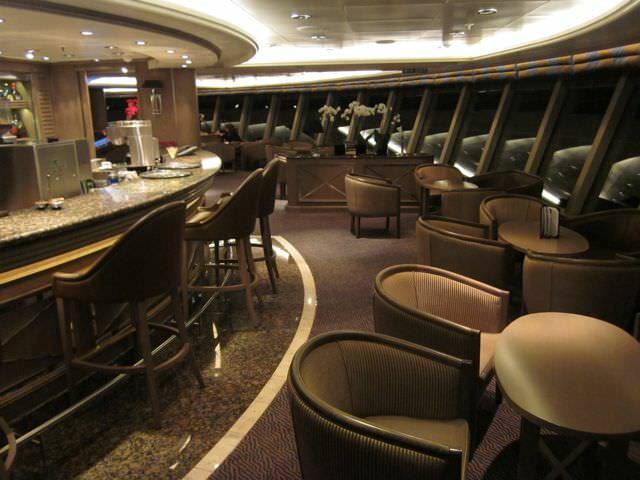 Situated all the way aft on Deck 9 and surrounded by three sides of floor-to-ceiling windows is the Panorama Lounge. By day, events and contests like Trivia are held here, and by night, the sounds of music and dancing beckon guests to linger a while. 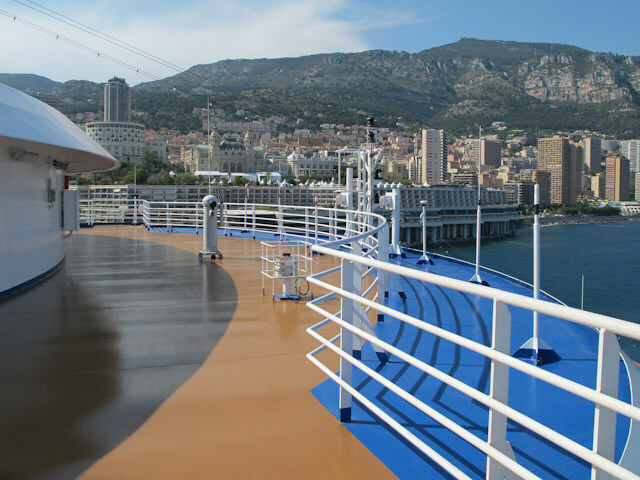 For early-risers, coffee, juice, pastries and fresh fruit are served up here, or out on the adjacent aft-facing deck space. Pull up a comfortable chair or clamshell lounger and enjoy! 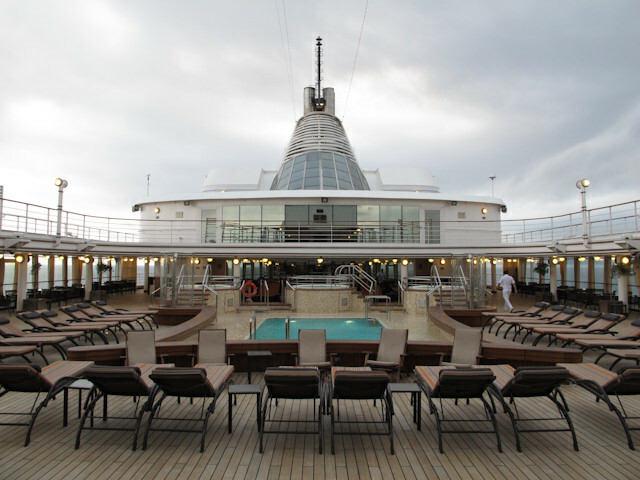 At the forward end of upper Pool Deck is a covered awning area with tables and chairs. 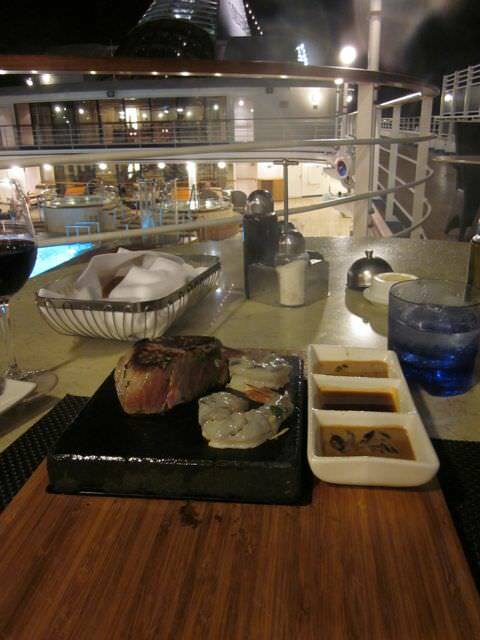 An extension of the poolside grill during the day, this area becomes one of Silversea’s most popular dining options at night: the exquisite Black Rock Grill. Here’s how it works: you choose from a selection of meats and seafood, and these come fresh to your table for you to cook atop your very own slab of superheated volcanic rock. It’s casual, it’s fun, and it’s popular: so much so that Silversea has plans to roll it out fleetwide. 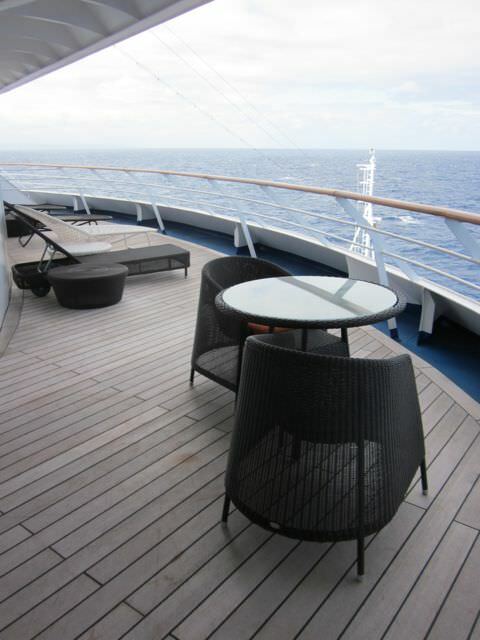 The after end of this deck turns into a wide, open space, perfect for jogging or getting that perfect photo of the sea. There’s no shortage of suite types aboard the Silver Spirit, but arguably one of the best types has be the ship’s Silver Suites. At 742 square feet, these rooms boast a spacious living room and dining area, complete with flat-panel television, minibar, and a full-size table and writing desk. With all this space, you might be tempted to take your meals in the comfort of your room, or on your double-wide balcony. Your butler will be happy to arrange it, and he’ll even bring the full dinner setting with him, even serving the meal course-by-course if you so wish. A separate bedroom and full walk-in closet are adjacent, and feature sliding doors that can pull shut to separate the living room from your sleeping area. The lighting in these suites is attractive, with plenty of subdued accent lights that can be turned on with the flick of a switch. The bathroom boasts a separate shower, soaker tub, and toilet area. 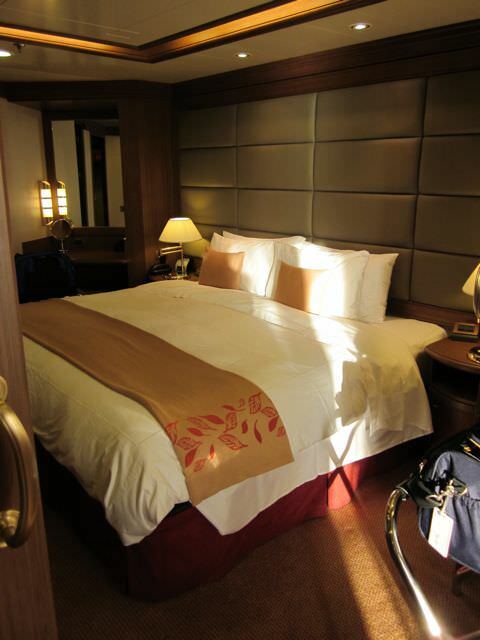 With all this included, you can be forgiven if you never want to leave your suite at all! 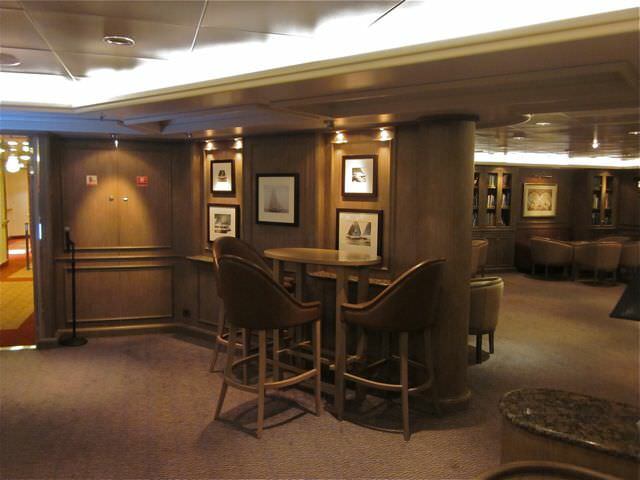 Hidden all the way forward on Deck 11, the Observation Lounge is my favorite public room aboard Silver Spirit. 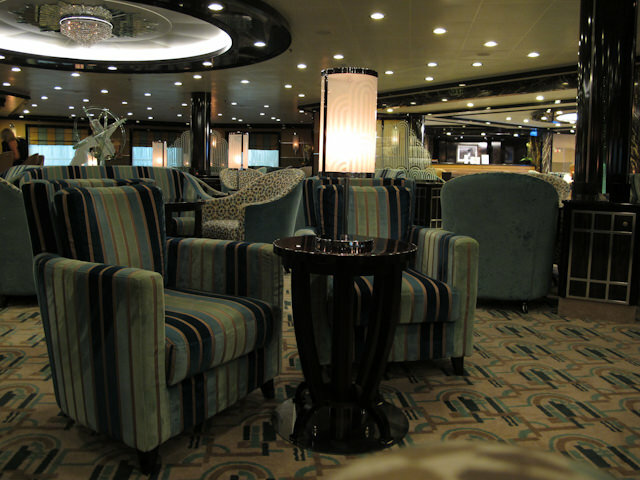 In fact, it might be my favorite public room on any ship I’ve ever sailed on. Why? For one, it’s attractive. Blonde wood panelling gives way to comfortable leather chairs and couches. 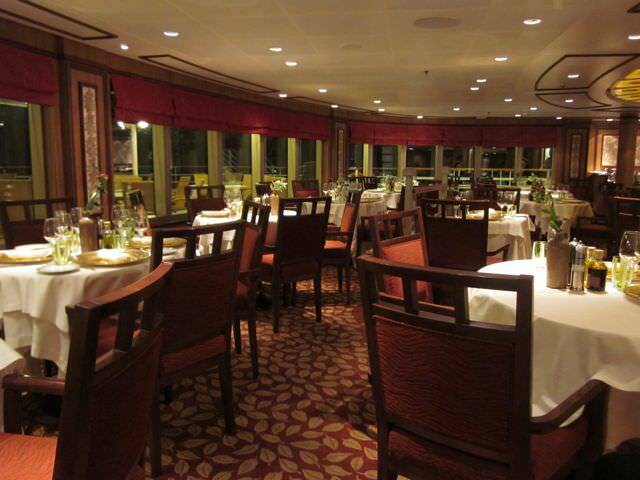 The whole room is wrapped in floor-to-ceiling windows that offer an astonishing view over the ship’s bow. 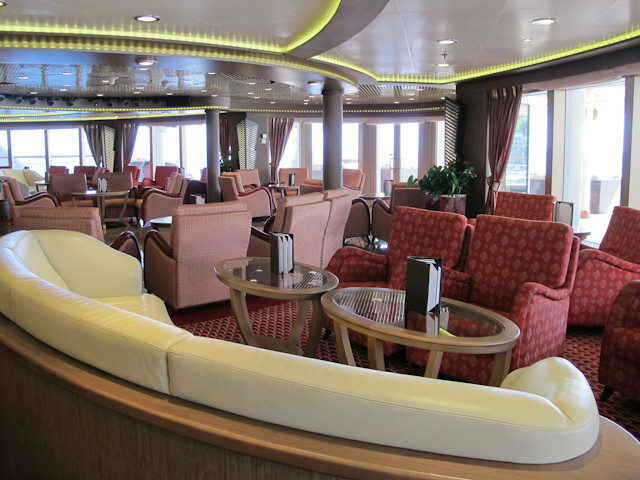 On the starboard side is a bar, stocked with pastries, juices and coffee in the mornings; tea and soda in the afternoon; and any conceivable drink you can think of in the evenings. On the port side of the ship are several bookcases that hold books on just about every conceivable subject. 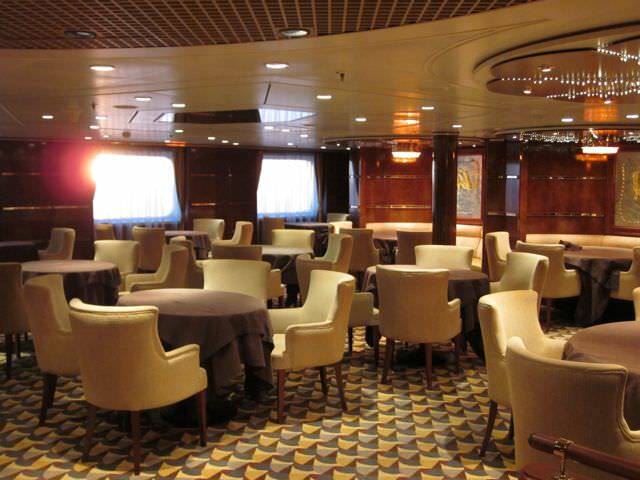 If you see something outside you want to get a better look at, you can take the exits that flank both sides of this room and end up on the outdoor observation deck; if you take the port side exit, you can even ascend one deck to stand above the lounge, in the shadow of the ship’s radar mast. It looks like a crew area, but passengers are able to wander as they please, up to the chain that separates the passenger space from the crew space. The other reason this is such a find? There’s almost never anyone here – and that says a lot on Silversea, because you’ll never have an issue finding a seat, anywhere. The combination of the books, the view, and the amenities always kept me coming back. In the end, the Silver Spirit won us over with her comfortable design and elegant interiors; qualities that are only enhanced by the exceptional service and cuisine onboard. 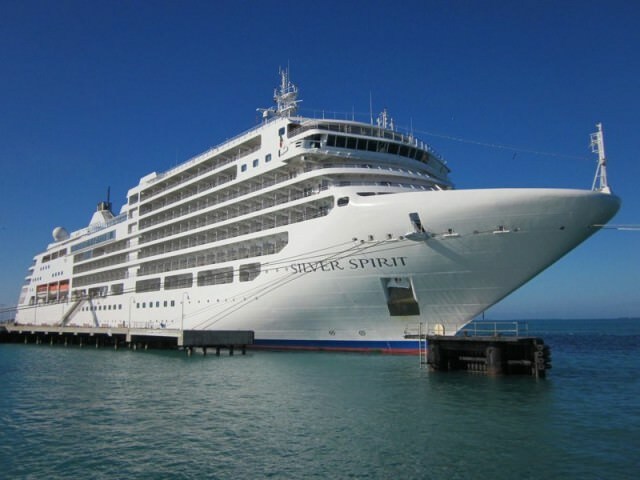 We heard lots of positive comments from passengers who had sailed the line’s smaller vessels, only to find a new love in the larger, but no less spacious, Silver Spirit.